The best thing the BC Lions have done this season is raise the sails at BC Place and limit the capacity of the arena. It’s a move that was heavily criticized by CFL football purists, and even a few in the media. Perhaps, it’s tough to admit what the CFL is, and, that is a 20-30,000 arena capacity league. There’s no shame in that. None. People, and specifically, families have so many options available to them, that travelling downtown or walking a few blocks over to catch a football game isn’t the only option available anymore. So, the team put the sails up, and problem solved right? Stands won’t look so empty on TV? The atmosphere will improve? People will come in droves? Hold your horses, if anything, this season has proved that the BC Lions have lost their silver medal position on the city’s sports team podiums. That position belongs to the Vancouver Whitecaps, as they are arguably the second hottest ticket in town behind that ice hockey club that plays in Rogers Arena. All hope is not lost though, there are five things the BC Lions can do to help ticket sales, presented below in no particular order. 1. Blackouts. Has there been a worse idea in sports today? The BC Lions have a home game, you can’t make it to the stadium, so you decide to watch it at home, but, lo and behold the game is blacked out. It’s happened before, and the Lions have said that they’ve entertained the idea on bringing local blackouts back. Maybe, you pull in a few more staunch fans, but you’re not going to find any new fans with such a maneuver. I’ll give you case study to compare, locally every baseball fan seemed to be either a Seattle Mariner or Toronto Blue Jays fan – and it’s not all to do with how the teams are performing. It’s a lot to do with how much they’re shoved down peoples throats. If you’re a baseball fan, you’ll watch whatever baseball is on, and if it’s consistently the Jays or the Mariners, you’ll likely end up becoming more familiar with the team than if no games were on TV. There’s a reason there’s a bunch of folks in Ontario who support the Tigers, and in the Atlantic, who support the Red Sox – they’re much more accessible. You want the casual football or sports fan flipping through the 50 high definition channels and landing on your product. 3. Promotions. The Vancouver Canadians play a short season, they have a team of players that no one knows, in a league with eight teams. Sound familiar? The Vancouver Canadians have done so incredibly well with seating and fans, that they just recently added an extension to the historic Nat Bailey Stadium to cater to even more fans. 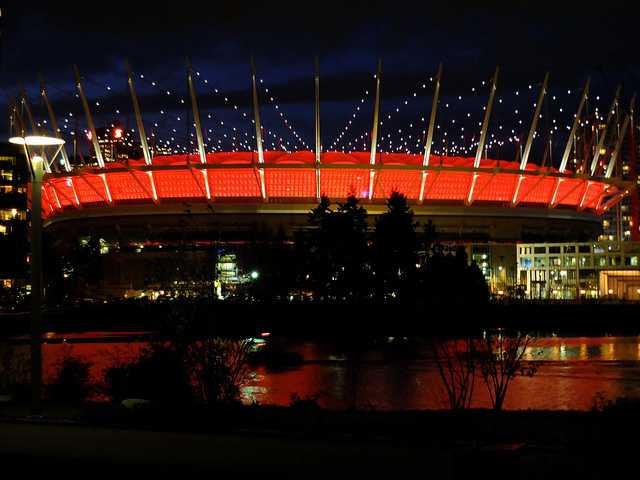 The pessimist may say, the capacity of the Nat is a fraction of BC Place, and tickets are so incredibly affordable. Well, there are many a show, and many a game in this great city that you can take in on any day that the Canadians play – yet 6,000 or so choose to attend a Vancouver Canadians game for a variety of reasons. One of them being the quality of promotions the team has, whether it’s a corporate sponsored night, where a 1,000 umbrellas are handed out, or a bobblehead night, where a 1000 people are lined up a hour before, or even a ‘Superstar Signing’ where people will often wait hours in line to get a ‘baseball legend’ to sign something, their promotions hit home. Fridge magnets these are not. You constantly hear people speculating that the NFL, more specifically the Seattle Seahawks are stealing the BC Lions fans. If that’s the case, why not capitalize on it? For the record, if a fan is driving down to Seattle to watch a NFL game, they weren’t hemming and hawing between the Lions and the Hawks – it just doesn’t happen. Before the NFL season kicks off, why not bring up a Russell Wilson for a meet and greet in stadium, a Warren Moon, a Doug Flutie, there’s likely a long list of NFL fan favorites who would come out and do a meet and greet. 4. Social Media. The old, grumpy man in the corner will shake his head at social media boosting ticket sales, but, it’s important to remember that he’s old, and likely grumpy because he doesn’t understand all of this hullabaloo. Those numbers are quite telling – out of the three teams, one of them is grossly under performing. The BC Lions account isn’t fun, it doesn’t share the personality of the team or the players, there’s not a ton of behind the scenes or ‘Only in the CFL’ moments captured. There is no fan driven, or fan focused content. There’s a whole market that literally only interacts with the world via social media, as sad of a statement as that may be – they’re still potential fans, and ultimately customers. All in all that’s roughly $266 on one night of entertainment. Is the experience worth that price point?